Why? To raise awareness of the the Government’s crude attempts to gag opposition from charities and campaigning groups. 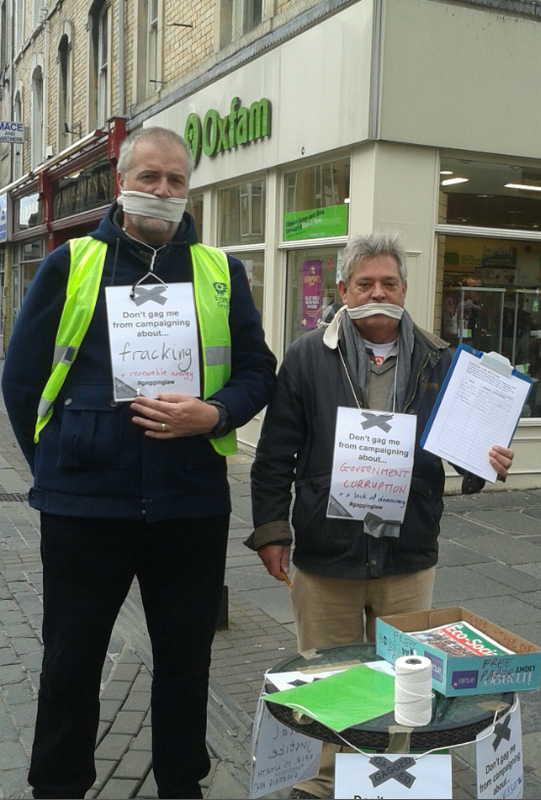 Outcomes: 137 petition signatures in 120 minutes; raised profile for Bridgend Green Party; numerous pledges of support for the work of BGP and the campaigning groups affected, especially re fracking, NHS cuts, the badger cull and zero hours contracts. And hopefully a new member or two. It was great to meet you and your colleagues in Bridgend town Andy. Likewise, Ian. When I say I am hoping we may have gained a new member or two …….. Looking forward to meeting you again sometime soon I hope. Our next meeting is the Railway on the 31st (good way of dodging the ‘Trick or Treaters’!